Time for my look back on 2015 and what I might aim for in the coming orbit around the sun. The highlighted word is dedicated to the #flatearth people I've been conversing with on Twitter recently. Wow. Like many people, part of the reason for doing these sorts of things really what every person should do semi-regularly -> write down your aspirations. I remember being taught goal setting from a young age and I think it's a life skill that many leave behind. Ahh, so many things to play with, so little time. There will be a lot going on for APEX again this year. No doubt you've already read Joel's summary of 2016. Oh to live in the US/Europe (or have fast, cheap, efficient modes of transport). Content for APEX at Kscope16 looks amazing, it's a shame it's a touch early to see stuff about OracleJET and the Interactive Grid in 5.1. That's OK, I'm still learning the full impact of life in 5.0. I'll continue to work on Universal Theme projects, which pleases me. Plenty still to learn and absorb, adjusting to our evolving development framework. Thanks again to the development team for the Page Designer, it has vastly improved productivity. I would like to see Share Components integrated into the Page Designer, certainly for viewing but I'm sure even editing could be cleverly integrated with modal dialog pages. I often operate with two browsers running the builder, Chrome for Page Designer; Firefox for Shared Components. I'd like to hear more about how the Universal Theme will change, what sort of life cycle it will have, and how information about change is relayed. I know it's changed since inception, and no doubt within patches. I wonder if any tweaks fix the little issues we've been finding. On my list is to copy an app, verify the them subscription, and try it out. Maybe export the themes and do a diff? Anyway, I've found CSS use has cut greatly since running UT, I've cut plenty from converted applications. I've even modified the balance I'm looking for between Dynamic Actions and jQuery. I truly could rattle on for ages. My three developer buddies at work will testify to that. Personally I would like to see more on ORDS. I feel related documentation is still maturing and there only seem to be a small handful of experts sharing their experiences & techniques. As someone with a prominent development hat, I'm thankful to have a colleague that understands that middle tier better than I. Unfortunately we're a small team and setting up JMeter for load testing is still on the list. I saw a bit of chatter online regarding mixed content issues on version 3.0.3, and performance issues after 3.0.1, both of which we experienced empirically. The ORDS team must feel what Android software authors face were there's a zillion combinations of infrastructure. Even though ORDS is sprouting it's own wings, I think the APEX and ORDS team need to stay tightly coupled. At this point I'd guess most ORDS deployments at least serve APEX. I've already overheard the observation that most people see it as a just that, and clients don't split hairs when something goes wrong. "APEX is down", and nothing worse than middle tier experts saying "not us" when it's certainly outside the database layer. We can't wreck this together unless the arm supporting ORDS gets more support. For a long time I've used Textpad for my text editing needs, but I'm tinkering on the edge of leaping to either Sublime or Atom. This needs to happen this year. Eddie, get me on it! Last year I said to Juergen that I'd help out with apex.world. So far I've written the intro post for Slack, but I still haven't honoured the other task he sent my way. I could blame the book, tendinitis, the holiday period, but I know there's procrastination in there, too. Sorry mate, soon. I doubt I'll get to any international conferences this year, but I'm going to start paying more attention to the Asia-Pacific region. I'm on the lookout for communities I'm yet to discover. That sounds like a tautology, something self evident, but let's call it a known unknown. I'll certainly hang around on Twitter and Slack, and I might get back onto the PL/SQL Challenge. I gave it a break for a while, but I need some 12c tips. I asked Tom Connor a question recently, I might spend some time perusing the headline questions, too. I intend to spend a bit of time finishing all sorts of semi-drafted posts, technical and otherwise. I'm not longer writing a book and this yearn to write has to go somewhere. I still have plenty of notes from my experience at Kscope15, which was amazing. I look forward to the time where I can travel more. I have fun when analysing the statistics from the previous year. I think many of us unknowingly love assessing numbers and statistics, which is my hypothesis as to why cricket and baseball are so popular. Readership growth has tapered, which I find interesting. Does that mean I've hit most people out there, looking for stuff, or have I just filled up my current channels? I must say it was fascinating at Kscope to hear about people who've read my blog or heard I was there and sought me out. Rambling on the keyboard to a faceless audience is weird sometimes, so I was thankful for the positive feedback. People compliment on my writing style, and I humbly accept and strive to improve. Big differences, no real surprises, is there? Mostly read on desktop, but mobile up 64%, but that's relative, not absolute. 3k mobile readers vs 53k on the desktop. Similar relative growth for social media vs organic searches. Twitter certainly is a growing factor in disseminating (and finding) technical content. I find this curious every time but only two articles from 2015 made it into top 10 most visited. One was Sample community applications, which makes me want to progress this idea further with the gang at apex.world. Second was my reference to Carsten's listagg clob. 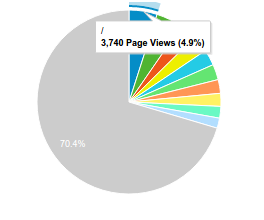 To add perspective, the reigning top page represents 4.7% of visits. If I interpret this correctly, the top 10 pages represent over a quarter of the year's page visits, which is quite the heuristic. My first book is complete. What a journey that was, with Kscope and APEX 5 thrown in between. A little shame about chapter 9, more on that to come, likely in some form of errata. I'll hopefully learn from that lesson. I bought a few myself with the Cyber Monday sales that I need to start reading. A have a couple on node.js but I look forward to learning heaps in the revised Expert Oracle APEX. I need to fit a novel or two in as well. We're have a short holiday in Bali soon, I no doubt have a good sci-fi ready to go. As I suggested in Monty's post about my APEX game, I've considered recording little videos showing I build the game, in addition to the presentation I did for the local user group. Nothing fancy, certainly not like Connor and Tim's videos, just little tutorials that watch me work. Even little things like rebuilding my sample application in the Universal Theme. I've also got a lot of video watching I want to do. I have a few set to go from ODTUG already, such as webinars I've missed because they've been on at 1am. I've barely seen many of Connor & Tim's yet, I just don't watch many videos, I prefer to read my content. So I've got to schedule some video watching time, certainly before Kscope16 videos flood in. They're my best alternative to being there, that and participating in the Twitter stream during the conference. As with any year, 2016 has plenty of interesting science to look out for, and I love it. I will continue to also tweet science stuff I find interesting, in addition to the usual #orclapex #db12c #jQuery hashtags. I've been planning to post a list of my favourite podcasts for a while. For those interested I have plenty to recommend. They make great listening during transit to work. Exercise that brain. Having a toddler has introduced a lot of viruses and some bacterial infections to the house. This made exercise a little difficult, but I have managed to swim regularly with a small group of guys at work. We do a steady 1km at lunch, aiming for once twice a week. That's awesome, but I have equipment at home I need to use more often in the morning, particularly with the amount of chocolate I eat, which has to come down! But first, I have to wait for what's apparently tendinitis in my right hand to calm down. I've done a decent job at resting it, but maybe that leaves room to help improve mental health. Take a walk, enjoy the sunset. Rest your eyes and let your brain do some awesome stuff in the background while you're admiring the world. On that note, enjoy your fresh start! I very much enjoyed reading this, Scott. Thanks for taking the time to look back and ahead. I acknowledge your shout-out to my team re: more help on ORDS. Hopefully you see some significant change this year in that regard. Best of luck staying healthy with your toddler inviting coughs and sniffles into the house on a weekly basis! "I think the APEX and ORDS team need to stay tightly coupled." YES, YES, YES! Thinking of the 3.0.3 debacle - and still no statement from APEX and ORDS team. You don't have to feel ashamed. I think that is one of the hardest stuff - it's the brige between two worlds and tecnologies. 3.0.4 is now out, apparently addressing the mixed content issue. But yes, check all ORDS releases carefully! The shame was the wrong version of the chapter made it into the book. Errata still coming, process a little drawn out.